After having tested and reviewed as many binoculars as I have, it is not that often that I get pleasantly surprised by a pair of optics as soon as I open the box, but this is exactly what happened upon opening up the packaging for these Hawke Sapphire ED 8x42 binoculars (model no. HA3767). This is because you are immediately presented with their stunning looking and very classy real leather carry case (you can read more on this and see the photos in the accessories section below). These roof prism bins have what Hawke Sport Optics describe as a "Top Hinge" body design, which is sometimes also called a "True Open Hinge" that initially looks very much like a traditional roof prism shape, but you will notice that instead of a large bridge that covers most of the length of the barrels, this single bridge is much shorter and instead of being located centrally is positioned closer to the eyepieces. Not only does this does the smaller bridge help to reduce their overall weight, but it gives you more surface area on the ends of the barrels to hold onto for a better, more secure grip when carrying the bins one handed. The whole body, apart from the bridge is has been covered with a dark green rubber armor (there is also a black version - model no. HA3765) which is comparatively thin and a little harder than that found on many others I have tested. Because of this it possibly offers a little less protection and grip than some. However there are textured areas located on the sides of each barrel which counter this. There are also a couple of thumb indentations located on the underside of the body which do a terrific job of "directing" you to hold them in the correct way and in the correct position when glassing so that they are perfectly balanced. A well balance pair of bins is important, especially when you spend a long time looking through them, or when when trying to observe fine details as it much easier to keep the image still. This matt finish, even where the body is not covered in rubber (on the hinge and eyecups) helps to prevent any unwanted reflections that could give away your location or frighten wildlife. The objective lenses are set quite deeply within the ends of the barrels (about 8mm), this is another aspect of the design that I am a fond of because it better protects your lenses when the lens caps are removed, from scratching and from getting dust or moisture on them. Another advantage is that it can help prevent lens flair and is similar to the lens hood used by photographers. The body of the Hawke Sapphire ED series is constructed from a magnesium alloy a comparatively expensive material, but one that is lighter and stronger than the aluminum or the much cheaper polyamide (nylon) plastic sometimes used. As you would expect these days with a binocular in this class the Sapphire ED is fully waterproof and have been tested by submerging them to a depth of 1.5 meters for 3 minutes. They have also been Nitrogen Purged, meaning all the internal air has been removed during their manufacturing and has been replaced with a dry nitrogen gas. This helps stop the internal glass surfaces from misting up, which can occur on unprotected devices when you get quick changes in temperature - like when you come into a warm house from being out on a early morning walk in winter. Another advantage of this completely moisture free environment is that no corrosion will occur, increasing the life of your investment. 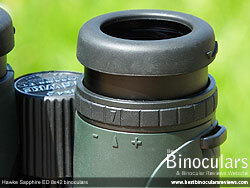 Covered in a somewhat hard rubber, the housing on the twist-up eyecups looks to me to be made from metal, which is better than the hard plastic ones that you often get with optics in this price range. Because the rubber covering is fairly hard, provide less padding when pushed up against your eyes as some. However they are large, having an external diameter of 43mm and are wide (6mm), so I never found them to be uncomfortable. The twist-up mechanism was smooth and worked well on my sample and these 8x42mm Sapphires come with and eye-relief of 18mm, which should be adequate for those who wear glasses to use the bins without having to remove them. On the down side, they only have one "fixed" halfway stop between fully in and fully out, which potentially gives you less flexibility to get the distance exactly right. Having said that though, the mechanism has enough friction to it, that you can stop and keep it in any position, should you need to. When you collapse the hinge, the minimum distance between the centers of each of the eyepieces (inter-pupillary) is 6cm, full opened it is 7.5cm. Compared to the metal housing on the eyecups, the plastic feel to the focusing wheel is a little bit of a disappointment. There was also a tiny bit of play on the pair I was testing and the amount of resistance to turning was a touch too much for my preference. On the plus side, the wheel is nice and large (30mm diameter) which makes reaching it simple and the rubber covering is grooved for extra grip. The wheel also extends out enough from the top of the body (even with the hinge of the binocular fully open) to make accessing it from the standard grip nice and simple, which if you use your bins in winter with thick gloves on is important. Taking just a little over 1½ full rotations of the wheel to adjust the focus from close focus to infinity and so I'd describe the gear ratio of the mechanism as about average as some I have tested take only half a turn and others take more than two. This means that focusing from near to far is moderately quick and adjusting the fine focus is simple enough. 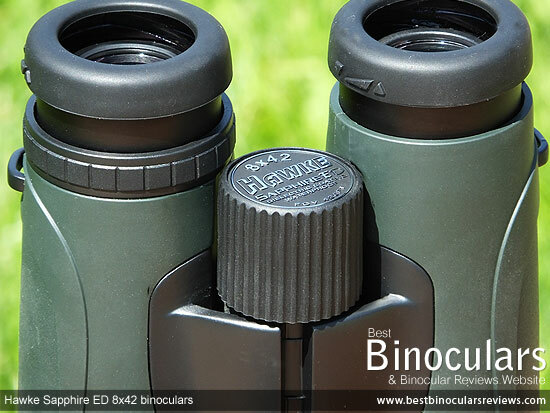 As with most roof prism binoculars the diopter adjustment dial that enables you to allow for any variations in each of your eyes by setting up one barrel to focus slightly differently than the other is situated on the right barrel near the eyecup. It worked well enough with just enough friction to make sure that unwanted movement was not simple. But it does not lock or click into place, something that you sometimes get on higher end bins. Apart from the + and - signs and the neutral arrow, there are no scale markings, so if your particular setting is different, it may be an idea to make a mark on the barrel with a sharp knife or pen, which makes it simple to return it to the correct setting without having to re-calibrate it, should you need to. 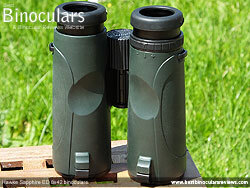 For more on this you can take a look at my guide on how to calibrate and focus binoculars. I feel that it is important to stress that whilst it is nice to have a lightweight pair of optics, sometimes a pair that is extremely light can "feel" a little cheap, be poorly balanced and possibly be made from substandard materials and components. This is most certainly NOT the case with the Sapphire ED, as we have already discussed, the chassis is made from a high end magnesium alloy, which weighs less and is stronger than aluminium. 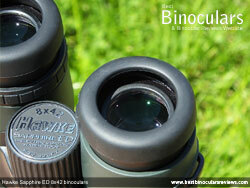 Fully twisting in the eye-cups and with their lens covers removed, the length is 14cm (5.5in), which is what most manufacturers advertise as the length, this for a full sized bin is nice and short and makes these Hawke binoculars one of the shortest 8x42's that I have used. After fully extending the eye-cups this moves the length out to 14.5cm (5.7in). Then with both the objective and eyecup covers attached: 15.4cm (6.1in), which is still very good when compared to almost all others in this class. Fully opening the central hinge their maximum width is 13cm (5.1in) and their height is 5.1cm (2in), this is what most advertisers use to advertise their width and height and once again means that for a 42mm bin these are relatively compact. Fully folding the binoculars, I measured their width at their widest point as 11.2cm (4.4in) and their height as 6.8cm (2.7in). Whilst all these dimensions are comparatively compact for a 42mm binocular, they still felt well balanced and the large focussing wheel was very easy to reach and turn. I could not find any mention as to the exact design or how many elements are used in the lens, but measuring 23mm in diameter, the ocular lenses are a little bigger than many 42mm binoculars that I have reviewed. As is highlighted in their name, the Hawke Sapphire ED has one element in each of their objective lenses that is made from glass that has extra-low dispersion properties. ED glass elements essentially allows the designer of this multi-element lens a little more control and flexibility to ensure that they can better direct the light through the lens so that when it comes out the other side all the different wavelengths are in sync. Thus they can potentially produce a better quality image with little or no chromatic aberrations (seen as color fringing). For more on this please read my Complete Guide to Extra Low Dispersion Glass. Whist ED lenses are becoming more and more popular, they are still fairly expensive to produce as they are more complex to design and as such only used on higher spec optics. Hawke describe their lenses as being "Fully Multi-Coated", which is great as it means that all surfaces on all lenses have received multiple layers of a special anti-reflective coating during the manufacturing process. Lower quality bins will use lenses that only have single layer coatings on all or just some of their lenses. These coatings play a large roll in ensuring that as much of the light that reaches the outer surface of the objective lens, gets to your eyes after leaving the ocular lens and thus will produce a higher quality and brighter image than lower the same size bins with less or lower quality coatings. This is something that I have seen many times when comparing good quality bins with poor quality ones of the same size. Hawke Sport Optics have also added special water repellent coatings to the outer surface of the objective lenses, which is what I think gives them the slightly red tint. This ensures that water simply rolls off the lens surface making for better viewing in wet conditions, but also means that water marks are not left behind, which would require more forceful cleaning of the lens, which in turn could lead to you damaging them. 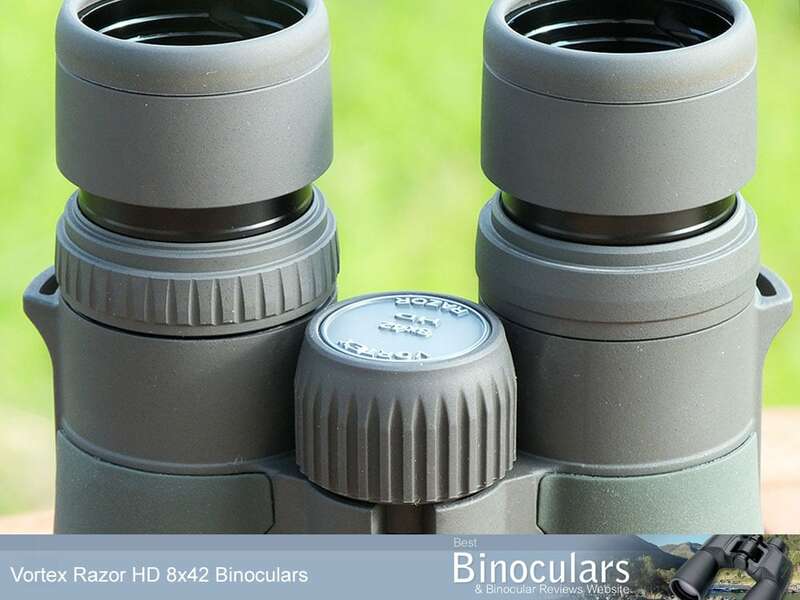 The roof prisms in the Sapphire HD binoculars are made from BaK-4 glass, which is in many cases much better than the BK-7 prisms sometimes used in cheaper optics. The roof prism design has a slight flaw in that one of the surfaces does not reflect all that light that hits it and so left untreated, you get some loss of light. To counter this a highly reflective single or multi-layer coating is added to this surface. As far as I know, the cheapest option is to use an aluminum coating that is often quoted as having a reflectivity of between 87% and 93%. Next in line in terms of cost and performance and what is usually found on roof prism binoculars in this price range are silver prism coatings that produce a reflectivity of between 95% and 98%. However I was very pleasantly surprised to discover that Hawke Optics have added a dielectric coating to the prism, something that is only regularly found on the very best, far more expensive binoculars and so to see them on these, at this price is great. 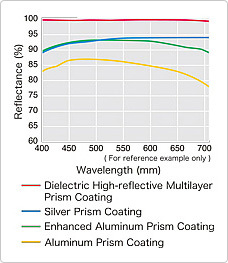 Dielectric coatings are said to have a reflectivity greater than 99%, however and being cautious, the wording they use is "Dielectric Prism Coating", which I take to mean that they only use a single layer as opposed to a multilayer coating. So I am not sure and if like the anti-reflection coatings on lenses, how much difference a single versus a multi layer coating makes, but whatever the case, it is bound to be an improvement on the silver prism coatings used by much of the competition within this price range. Hawke do not mention if they also add phase correction coatings to their prisms on the Sapphire ED, which counter the "phase shift" that occurs in the roof prism design and which causes a slight loss in image sharpness. However due to the fact that they use the best quality glass and highest spec dielectric coatings on the prism, I will assume that they have. I am not sure if anyone reading this can confirm this for me. Update: A BBR reader kindly sent me some information confirming as I suspected that these Hawke bins do indeed use phase correction coatings on their prisms. At 426ft wide at 1000 yards (142m @ 1000m) the FOV on the Sapphire is very wide. This translates to an angle of view of 8.1° and thus they easily make it onto my list of wide angle binoculars and will bring a smile to most birders, wildlife observers, hunters or anyone looking to scan over large areas quickly. Their minimum close focus is rated as 6.6ft (2m), but I measured the close focus on the pair that I was using to be under 6ft which is excellent and as such these would be great for the occasional viewing of things like flowers, butterflies or dragonflies from close range. 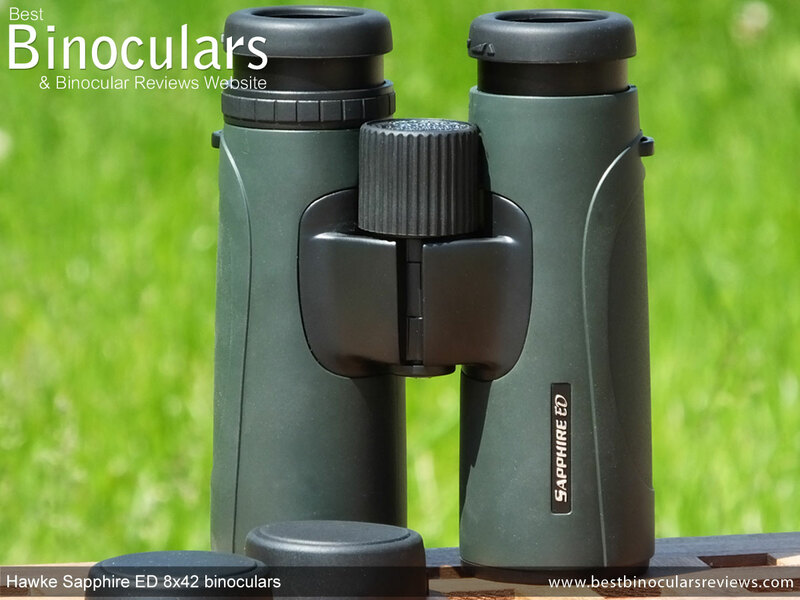 At 18mm, the amount of eye-relief is excellent and they join my list of binoculars with long eye-relief and in many ways are a good choice for those who want to use them whilst wearing their glasses. 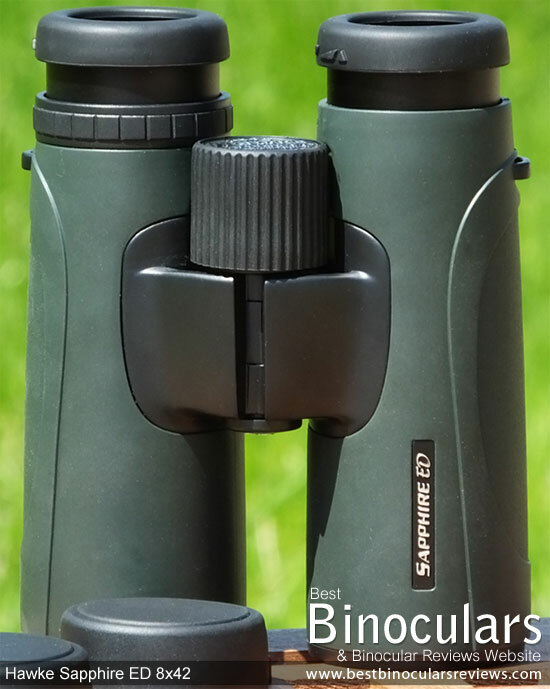 As with all my reviews and to be as consistent as possible in what is a very subjective area, I compared the view through these Hawke Sapphire binoculars with my similar sized control binoculars, in this case I used my 8x42 controls. I took the comparison tests during the day in good light conditions and once again at and just after sunset when the light went from poor to very poor. In good light and as expected image brightness between that of my mid level control 8x42 and the 8x42 Sapphire looked to be the same to me. In poor and very poor light I was able to detect that the Sapphire produced a image that I thought was a little brighter. Against my high end 8x42 control they were perhaps a fraction less bright, but there was really not that much in it. Thus based on all my other reviews and how I place my control in the pecking order, I rate these as very good, but not quite excellent for image brightness compared to others in this size class. (If you don't understand why you can usually only sometimes see the difference in image brightness between binoculars in poor light, read my complete guide to the exit-pupil). Image contrast was also very good and gives a good sense of depth to an image. I thought the colors produced also look natural, but perhaps is just a little less vivid than my high end controls. Again this is a very subjective area and the difference was very minimal. The method I use to test the depth of the field is to first focus on an image and then look beyond it without changing the focus and see how far I can get. The Sapphire was to my eyes the same as that of my high end control and thus I rate them as very good to excellent for an 8x42mm binocular in this area. To check for any color fringing caused by chromatic aberration, my method is to focus on very light coloured and white objects directly in front of dark backgrounds, or to look at dark image edges, like that of walls directly in front of a bright sky behind them. Whilst I was able to notice a very small amount of colour fringing, it was very minimal and only just noticeable when you are looking for it and so rate these as being very good, almost excellent. The amount of softening right on the edges of the view was minimal on the Sapphire and whilst it was more than my high end control, they are as good as my mid level controls. Thus I rate them as good to very good and at least as good as most others in this price range. To sum up, I would rate the quality of the image produced by the Hawke Sapphire ED 8x42 as very good. They are not quite up there with the very best, but in this price range they are pretty much as good as any other I have used. As you can see from above, these Hawke bins compare very favorably in almost all areas but especially with their very wide FOV, which remains true even when compared to some alpha binoculars that cost a whole lot more. Made from genuine leather, the carry case has a semirigid design that does an excellent job of protecting the binoculars and is far better at doing so than the much more common soft bags. The design itself exudes a timeless class and they really would not look out of place at a bird meet, or indeed a day at the horse races. I thought that the polished leather exterior not only looks good, but unlike most other soft cases, will also protect your optics from getting wet in the rain. The lid is held securely in place using a magnetic clip that works well and is much easier to open and close than a quick release buckle and more silent than Velcro which is important in some circumstances. The binoculars fit perfectly inside, with just enough room to make taking them in and out no problem, but not so much that they fall about. I like the fact that the lid can be properly closed, even when you have the eyecups fully untwisted and the neck strap, lens covers and rainguard attached. This may seem like a small point but you won't believe how many manufacturers miss this and it can be a real pain having to twist them in and out every time you use and replace your optics. On the rear of the case is a strap that has a loop in it, that you could use to attach the bag to your belt. Sewn onto the sides of the bag there are a couple of metal loops that are used to attach the included carry strap to. Like the case this strap is made from leather and connects to the bag using a couple of quick release clips made from metal. Although the strap is very well made, if I had to make a small criticism, it would be that it is un-padded Padding would obviously make it more comfortable, but would then not fit in with the classic look of the case, oh the suffering you have to endure to look this good! Another small downside to this design is that it does not have any separate pockets, which some people find useful for storing small items like a lens cloth, some change or your car keys. To sum up the bag I would like to say that you only usually find really expensive cases like this one included with top end alpha bins, mostly because this is one area where manufacturers are able to cut costs without having to compromise on the actual performance of the optics. So seeing it included with what is essentially a mid-high priced binocular (albeit a very good one) it another reason that makes it all the more impressive to me. Not quite matching the build quality of the carry case, the neck strap is still much better than average. It is very well padded (about 5mm thick at the deepest point), is nice and wide (4.2cm at the center of the strap) to spread out the weight over a large area and is curved to fit around your neck and shoulders making them very comfortable. Where it slightly lacks in comparison to the very best is at the point where the padded section joins to the nylon strap that you thread through your bins. I like the ones that have a looped connector that enable a little more freedom of movement when you lift the bins up to your eyes. On these the nylon straps are simply sewn to the padded section, it is a very small point but one that I feel is worth mentioning. The Sapphire's lens covers are great, not only do they fit really well preventing them from falling off, but unlike most caps that fit over the ends of the barrels, these fit flush with the inner surface of the barrels for a much cleaner look that will also help them from being accidentally removed. 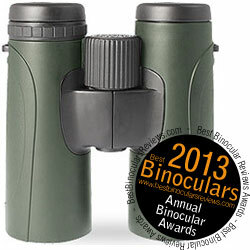 Made from a soft and flexible rubber, like many binoculars they are attached to the binocular, however unlike most that simply use a rubber loop to wrap around the ends of barrel, these have a clip that fits into a recess under each barrel for a far less cluttered, more polished look that really helps to emphasize the clean lines of the binocular. I don't know if it is because of this, but the lenses are also set very deeply within the ends of the barrels (about 9mm) which is great as it really helps to protect them, is said to help prevent lens flair and can help prevent the lens from reflecting back light which could give your position away - an important consideration for activities like surveillance or hunting for example. Having the covers attached to your bins means you should never misplace them and encourage you to keep them protecting your lenses when not in use. However if you don't like them attache when using your bins, you can always unclasp them from the body and store them in the carry case. Like the objective covers, the eye-piece cover is made from a soft, flexible rubber that fits well over the ends of the eyecups. It has a flexible bridge between the two cups enabling you to attach it to your eyecups, no matter what you inter-pupillary setting is. There is also a loop on each of the cup that you can use to thread the neck strap through. The Sapphire comes with a good quality lens cleaning cloth for basic cleaning, however for thorough cleaning you should probably invest in a specifically designed Lens Cleaning Kit that will ensure that you don't damage the coatings on the lenses during cleaning. The bins come with a rather basic binocular user manual that includes a small amount of information on adjusting the bins to your eyesight, focussing and caring for the optics. Also included within the booklet are the details of the 10 year Hawke Worldwide Warranty. As with most full sized roof prism bins, the logo cap on the central hinge can be unscrewed, which you can then screw in the standard ¼-inch tripod adapter which can then be attached to a tripod. Strong Points: The width of the view is outstanding, with only very minimal distortion at the very edges. The high quality optical components and their coatings also provide you with a bright, high quality image. 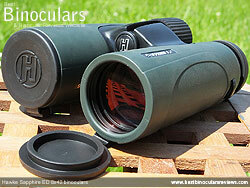 They also have a very good close focus and plenty of eye-relief, ideal for those who wear glasses. The quality of the carry case is exceptional, admittedly this style and design may not be for everyone, but there is no denying that it is made to a very high standard using top end materials. I also love some of the small touches like the tethered lens caps that click into the body rather than just using a rubber loop that demonstrate to me a good attention to detail. Weak points? Being this good at this price, it is hard to be to critical, but the small amount of play in the focusing wheel is a small gripe of mine, not a deal breaker. Ideal Uses: The very wide FOV, combined with a bright, high quality image, but relatively compact and lightweight frame make them perfect for a wide range of activities and as such I would highly recommend them as ideal general use bins. 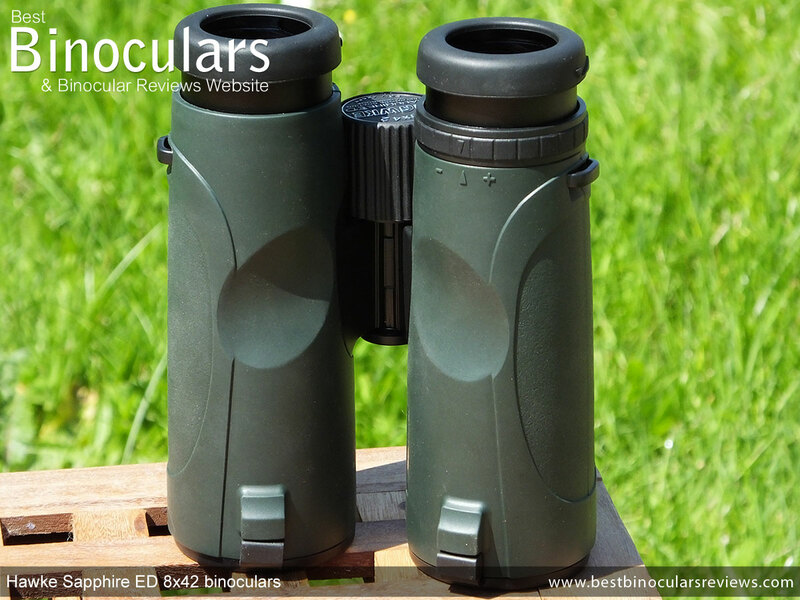 For these reasons, they will also most definitely make fantastic mid-level binoculars for general wildlife observation and in particular bird watching. 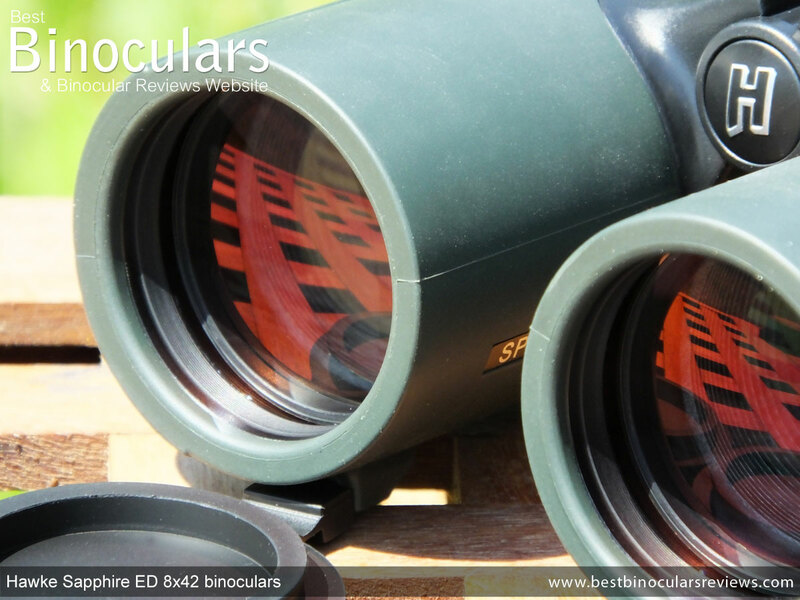 As well as these features, the tough, waterproof and unreflective body, combined with deeply recessed lenses make them perfect as hunting binoculars, especially if you need to scan large areas for movement, where the wide FOV will be a real benefit. Most certainly! 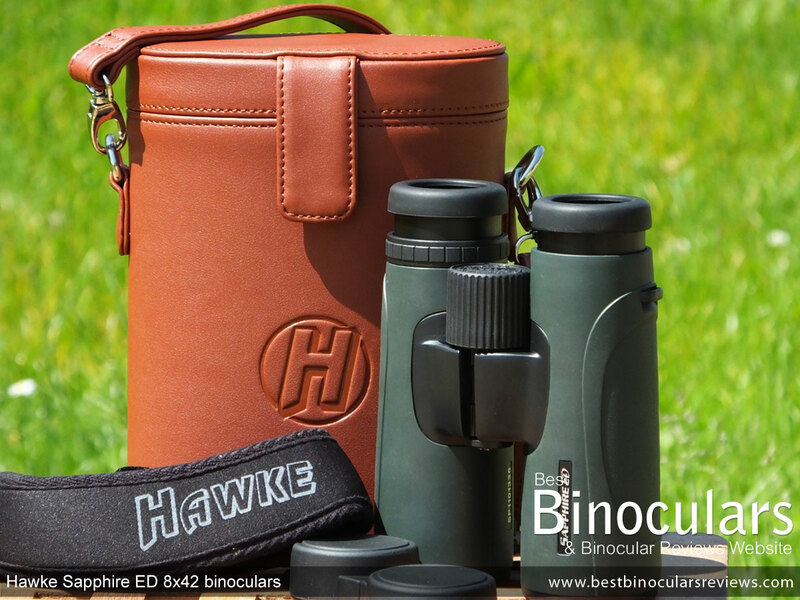 At their current retail price they are positioned in my Mid-High Value Binoculars price category (approx: $300-$500 / £300-£500) where there is a lot of competition and quite a few other really great bins, however in my opinion these Hawke Sapphires rank up there with the best of them in almost all aspects. To be considered great value for money on BBR they needed to achieve a score of 85% on my scale, which as you can see below, they achieved and thus they are in my opinion great value for money in their price class. Overall - On opening the box I was pleasantly surprised with the carry case, on much closer inspection, thorough testing and real world use out in the field, I have not been disappointed in any way. Highly recommended and in my opinion is up there with the very best mid-field bins currently on the market. For another opinion, take a look at this review from Birdwatch Magazine (723kb). 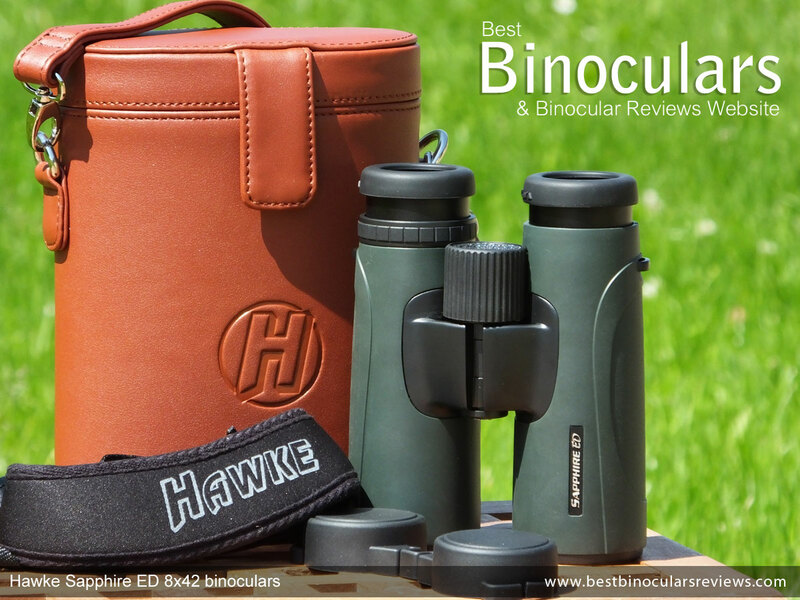 I would like to say a quick word of thanks to the guys at Deben, the UK distributors of Hawk binoculars and spotting scopes for sending me this and indeed other samples to review (coming soon!). I would also like to mention that this binocular review, like all the others on BBR is completely, 100% my own opinion of the product and I have not been swayed in anyway to write in a certain way. What is more, I spend a lot of time testing and using each binocular I review, unlike many bogus reviews out there that simply make up a story based on the marketing material and have never actually used the binocular.